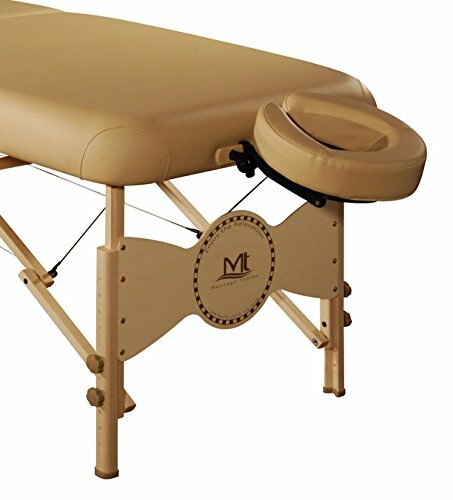 Mt Massage's Midas Plus portable massage table is elegantly beautiful and is a best seller for many reasons include but unlimited to thicker foam cushion, reiki end panel, shiatsu cable release, 5 year guarantee PU, Big Top, Rounded Corner, Auto Lock hinge and lower price. Clients will revel in the additional comfort provided by the 3" thick cushion of Multi Layer Small Cell foam, round corners and wide shoulder "Big Top" bed that gives 26% more cushioned surface than most tables. Protecting the foam is the silky soft PU upholstery that's oil and water resistant, CFC free, that emits no odors or toxins and which is backed by Mt Massage's 5 Year Guarantee. The Shiatsu cable release so the table can be laid flat on the floor make the Midas Plus an undeniably great buy. Reiki plate of the table also allows professionals to work comfortably closer for neck and legwork, and to even work from a seated position.The Auto Lock leg system allows the table to set up strong in seconds, and strength is reinforced with Auto Lock hinges at the center of the table as well as the stabilizer bar. Setting up the table is a breeze with the no assembly required. Dual Soft Touch leg knobs provide easy grip, safety and stability. All wood used for the table is free of formaldehyde and carcinogens in compliance with the California Air Resources Board (CARB) law. This professional package includes an innovated adjustable ErgonomicDream Deluxe face cradle, memory foam face cushion and carrying case. Five colors available: Royal blue, King's purple, beige, Burgundy, Black. 30" width x 84" length x 24" to 34" adjustable height; the table itself weighs only 34lbs. 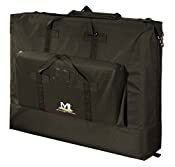 3" thick cushion of Multi Layer Small Cell foam is denser than regular foam; the silky soft PU upholstery is oil and water resistant, CFC free and comes with a 5 Year Guarantee. Light natural Northern hardwood legs are protected with a rich, hi gloss Dura Seal finish; the table also features a patented AutoLock hinges for maximum strength at the center of the table. Auto Lock hinges for maximum strength at the center of the table.1,500lbs. Aircraft grade steel support cables give the table a working capacity of 750lbs; also features Shiatsu cable release and Reiki leg panels. Accessories include: innovated adjustable ErgonomicDream Deluxe face cradle, memory foam face cushion and carrying case.